Red and Yellow Cotton Baby Blanket. The yarn is washable and anti-bacterial. The blanket itself is a bit heavy and chunky, but it is warm and soft on the skin. It took me around 8-9 months to complete as I am still a beginner. 1 Set of No 4, 5 Bamboo knitting needles. I used Lion Brand Yarn's pattern generator (for afghans) to help me decide on colours. Since it was my first project I knitted the whole blanket in garter stitch. Each quadrant was 50 st x 45 rows. Notes... This project is a very special one for me, because it is my first knitting project ever. My grandmother taught me how to knit at the age of 24 (better late than never). I decided to have a baby blanket for my first project, because I wanted to knit something special for someone truly special I haven't seen yet :) As a wanna-be mum I can't wait to start using my baby blanket. Member project Watch me grow 1st birthday photo decoration! Wow! 8-9 months, I don’t have the attention span for that. It would take me years of being really into it but then completely forgetting about it for a while. Haha. Looks great! So impressive. Its beautiful! You should be very proud of your hard work! I’d love to make this white and soft pink! What a beautifully made blanket! 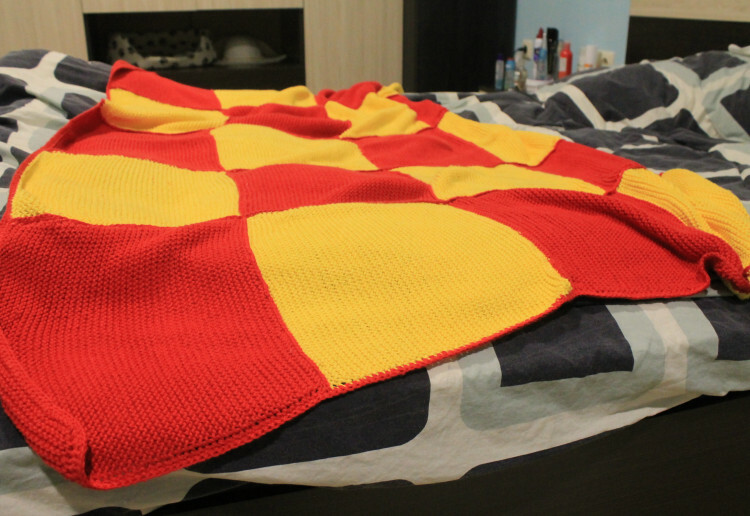 It could also double as a Harry Potter throw! This would be great for a little Gold Coast Sun’s supporter! lol!! That is beautifully made. That is a very fine effort for a beginner! Lovely… will be so warm… always seek out knitted garments/blankets for winter… and yes keep it for years and use it for yourself when they are “too big”! This looks great – I wish I could knit. I’ve tried, but just can’t keep the tension even.